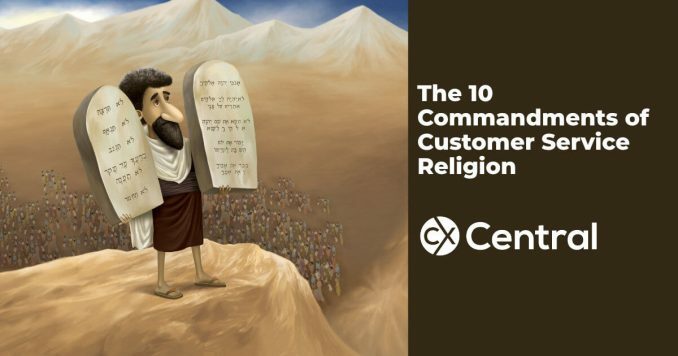 Today, when customer service is becoming a major differentiator for businesses, it is probably not blasphemy to call it a new religion a customer service religion for business! If we take on this term, the next step is to adopt some kind of scripture, a code to live by. Few weeks after Christmas, I was sitting in my chair and thinking that it would be good to remind myself what is really important. Serving customers is the main job for every business and every department within a business. But what makes up for good and efficient customer service? What is there that all of us should keep in mind and focus on, what are the guidelines? Like this, I have come up with a list of things, which based on experience, seem to be contributing the most to creating a great experience for clients and a meaningful relationship between a business and its customer. The 10 Commandments, you say? Why not!  I said to myself. Let them be the foundation of our customer service religion or Bible, or whatever name we want to call it, which we will be creating and writing down day by day through our interaction with customers in the process of building and growing our businesses. Im a firm believer that every relationship, be it a personal or a business one, starts with respect. If there is no mutual respect, there is no real relationship, there is only using each other. Not the most emotionally fulfilling experience for either party involved, and on a count-down from the very beginning. The customer wants to be honoured, to feel important and appreciated. How can we show respect to the customer? We can do this by giving our full attention to every interaction with the client, by speaking his language. Customers are individuals and they value sincerity. Sincere involvement with their problems is of the shortest ways to show your care and generate good feelings about your company. There are a few things that you can do to make it easy for customers. Be available and easy to reach. Whether it is a sales question or post-purchase support, customers want to know that they will be heard and helped. Availability is one of the first things that create trust. In the process of communication with clients, inform them of what is happening, respond quickly. Use efficient technical solutions to empower the speed and efficiency of your interactions. Educate the customer so that they feel free and confident to use your products and services. Knowledge is a great power, and if you empower your clients in this way instead of trying to make them dependent on your company and service, they will feel infinitely grateful and will always be coming back to do business with you. No great communication can happen if we try to put ourselves and our views first. In customer service, it is especially so. We need to listen to the customer very attentively and speak only as much as the situation demands. Being a good listener gives at least two benefits. First one is an emotional benefit. The customer who is listened to will feel comfortable with you, respected and cared for. Another benefit to listening is that it helps you to understand quicker and more precisely what the customer request is and so provide a faster and more efficient solution. Set the baseline for the customers expectation and let them know what you can do for them, what service you can provide. Then, if you can do more and exceed the initial expectation, you will have a customer for a lifetime. Be sure to always follow through with your promises, however. Underdelivering can dramatically damage your reputation. Just keep in mind this well-known statement underpromise and overdeliver. One of the cornerstones of effective communication is to be able to put yourself in the place of the other. There are many cases in customer service when a client is calling in to complain or give some negative feedback about your product or service. To avoid becoming defensive in such situations, the first thing is to try and see things from the clients perspective. This will allow you to evaluate the relevance of the complaint and find the right approach to the customer. In some cases, you may not even need any tangible solution, other than giving the customer additional information, an explanation which will correct his vision about the problem. If, however, there is an issue which requires some steps to be fixed, then putting yourself in the customers place will allow you to identify the problem correctly and be flexible about what solutions your company can offer. I call honesty a glue for relationships. If you are honest, you are strong. And you will attract strong and honest people to be your partners in business, your clients etc. I think exceptions are possible here. There are people who will misuse your honesty and will attempt to trick you. Some will succeed. Perhaps, it’s just your bad karma coming back to you. However, from my own experience and from seeing how our company is growing, I am inspired. Even if youve been tricked by a few people, the number of great relationships that you acquired through your honesty is the best thing you can wish for. Honesty pays off. That is my conviction. You are welcome to argue here if youve had a different experience. Honesty with clients means, whether it’s good or bad, tell them how things are, and do the best you can to make amends. Even if you cant do anything, it’s better to tell the truth and acknowledge that you are powerless. True people will appreciate and will not use your honesty against you. A part of being honest is to apologise when youve made a mistake. Acknowledging that it is your fault and not trying to shift responsibility on someone else, on the politics or weather etc. is honesty in its purest state. I feel an apology is an important aspect of customer service communication. It helps to build trust with clients. It helps to find solutions faster because you are not avoiding to look at the problem and be proactive about it. After all, it shows the customer that human beings are working in your company and he is interacting with humans. So really, there are no excuses for withholding apology when it is needed. It helps to understand that if you want to get a good fruit crop from a tree, you need to water the roots of a tree and not the flowers. Similarly, if you want to be a successful business, you need to understand the importance of creating a strong, honest, sincere and mutually beneficial relationship with your customers. Just trying to extract the benefits from someone never really works in the long run. How you want to serve your customers and carry out your relationship is up to you, but without one, there is no question of a lasting success in sales. It’s important to know what your customers think about your product or service. One thing is you can use this information to improve your product/service. Another reason you should always follow up with your clients is to show that you care about their satisfaction, value their opinion and would like to use the feedback you receive from them to help other users. Taking care to follow up indicates your intention to build a relationship with your customer, and to show thats it’s not a short-lived one-way interaction. So when asking for feedback, try to stress the importance of the customers opinion on the product or service, rather than trying to make another sale. It’s not possible to underestimate the value of saying thank you. I would say that it works even when said automatically, out of cultural conditioning. However, if one truly means it and feels it in the heart, the power of thank you is limitless. I believe that we should express gratitude to our customers on every occasion, as many times as many opportunities we get. One day we may no longer have the opportunity to say thank you because the customer has already left. Gratitude has the power to change and transform our lives, let alone to create a positive relationship with our clients. We should be grateful for everything: as a business  grateful for every customer, as a human being  grateful for our life and everything that weve been given. Somehow, gratitude makes us feel much much better about our own self and about our life. Im not sure how exactly this works, but it does work. Find gratitude in your heart the next time you are speaking with your client and try to express it sincerely. It will do miracles, I am sure. If you need some help to improve the CX in your business search our Business Directory for specialists suppliers including consultants, technology suppliers and more. Customer Experience – a new world or a new word?